Esoteric as it may seem from a business perspective, the server platform, powered by the processor, can make a significant difference in the financial outcome of a virtualization effort. Technological factors such as processing power, memory management and power consumption can translate into tangible business results. This paper showcases the business advantages of the AMD approach to virtualization at the processor level, focusing on the use cases of consolidation, agility and business continuity. The potential business and financial gains from virtualization are easy to see but not always simple to realize. The benefits of the technology are well understood at this point. Being able to spin up VMs when needed and spin them down when finished has a clearly demonstrated economic value for server consolidation, IT agility and business continuity. However, getting the right results from virtualization - cost savings, flexibility, performance and manageability - involves bringing together hardware, software, networks and infrastructure in a complete server platform solution. 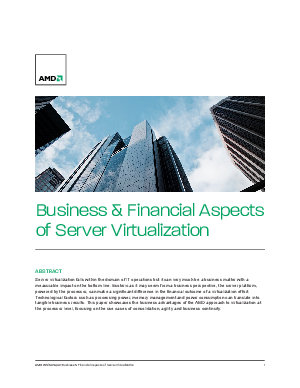 Download this whitepaper to learn more about business and financial aspects of server virtualization.